Evergreens are a beloved hallmark of winter. They grace our living rooms at Christmas time, provide wintertime shelter for squirrels and birds, and add bright, cheerful red berries to an otherwise subdued landscape. On a deeper level, they remind us that life and hope are always present, even in the bleakest and coldest months. 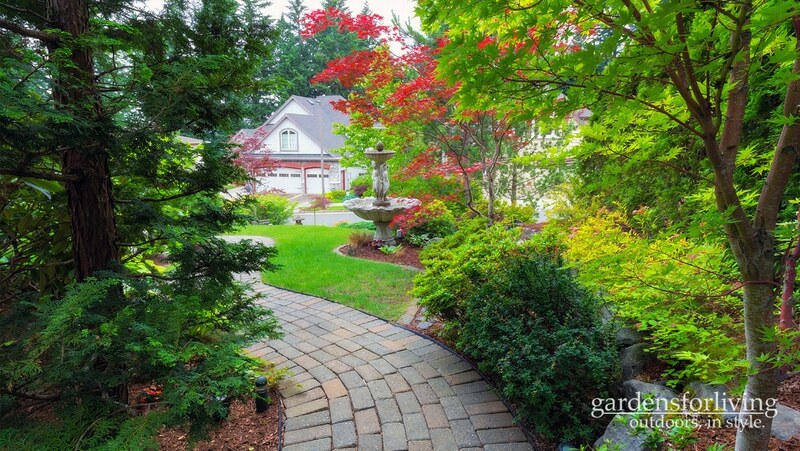 We love using evergreens in landscapes. They add great structure and dramatic beauty, and they serve very well as a complementary backdrop for deciduous trees, perennials and grasses. In most seasons they have a more subdued presence, but in winter they really shine. Most people underestimate the wonderful diversity and beauty of evergreens. Of course, you do have your classic dark green varieties. But some evergreens are a lighter green, some are a bluish green, and some are even a steel blue or a powder blue. The Oriental spruce is a particularly eye-catching tree – its old growth is dark green, but its new growth is bright yellow, so you have a beautiful contrast in the same tree. Playing up the color of evergreens is a great way to add contrast and interest in a winter landscape. But you have to be very thoughtful and plan very well. For example, blue is a demanding color, as the eye is drawn to it right away. So you want to use blue evergreens (such as Blue Spruce-Picea pungens or Serbian Spruce-Picea omorika) sparingly – usually just a few, in a strategically placed grouping. And you want to use blue trees and shrubs with companion plants that will complement their unusual color. Serbian spruces, for example, have a bluish cast, and they look great with the maroon bark of itea. Of course, it isn’t just about color. Some evergreens are trees, while others are shrubs or plants. Some are upright, tall and stately, with sparse needles. Others are short, round and full, with abundant foliage. Some have sharp, stiff needles, while others have soft needles that droop gracefully, or even broad leaves that fan out beautifully. Some have glossy leaves, which add a bit of shine, and some produce colorful berries, which add a bold pop of color and provide food for birds. All of this variety allows us to use shape, height, texture and color to create a living framework that will last throughout the year. Filling in the framework with trees and plants that look great in all seasons is the next important step. In our next post, we’ll be talking about deciduous trees that come alive with color and texture once all the leaves are gone. In the meantime, and while winter is still upon us, take some time to peek outside and admire your evergreens. You may just end up with a whole new appreciation for these beautiful plants!